Why study animals and literature now? Animal narratives appear around the globe from time immemorial: in our earliest creation myths and the texts that underpin the world’s major religions, in literature from “talking beast” fables to novels with animal protagonists, in works of philosophy and science, in visual media from film to internet memes. Animal tales, in many ways, have always been with us. They are how we understand our worlds, ourselves, and – this is where the trouble lies – animals themselves. 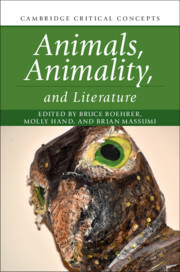 As co-editor of Animals, Animality, and Literature, I’ve been thinking about the exigency of our volume and of animal studies in general. Obviously, there is a difference between animal characters – animals as we come to know them through literature and media – and actual animals. However, in Western culture at least, how we behave toward animals, how we perceive and represent and treat them, is largely determined by how we learn animals in literature. Animal tropes, from Homer to Disney, still inform our thinking about animals. Arguably many of us encounter more animals in literature and media – that is, more animal representations or symbolic animals – than we do actual animals in our day to day lives. The shaping impact of these “virtual” encounters on our regard for both actual animals and humans is profound. What animals are held in highest regard? Perhaps lions top the list, or maybe elephants. But where does this predilection come from, and what of other, less visible animals? Consider the African Wild Dog, an animal that to many Westerners will bear a resemblance to the hyena – an animal Disney’s The Lion King so effectively taught viewers to despise. African Wild Dogs are endangered, and the World Wildlife Fund (WWF) currently has programs in place to enhance protections. One can even “adopt” an African Wild Dog and get a fuzzy little stuffed animal replica in the mail in what seems to be an attempt to render “cute and cuddly” a species that, thanks to Disney, is “guilty by association,” among Westerners at least. What does it mean to treat humans “like animals” or to declare them to actually be (non-human) animals, rather than people? The WWF endangered species list gets to the heart of the problem, in fact. Click on an animal in the list, and its page includes a section that explains, “Why It Matters.” I’m initially struck by the fact that WWF is impelled to explain why each endangered species matters, but I check my righteous indignation as I keep scrolling and see all the varieties of tuna included on the list. I had sushi for dinner two nights ago. Bluefin Tuna, like African Wild Dogs, don’t carry the same cultural weight as lions or elephants. Speciesism – discrimination based on species and the privileging and fetishizing of some (symbolically freighted creatures, like lions and elephants) over others (animals we eat, animals perceived as pests) – begins with how we understand animals through literature. Speciesism is not just about how we treat various animal species; it rests on the primary, problematic distinction between humans and non-human animals. Distinguishing between humans and animals enables us to then cast some humans as animals and therefore to treat them as such; speciesism thus underscores practically all other forms of discrimination. For this reason, to paraphrase Cary Wolfe, the exigency of animal studies thus has nothing whatever to do with whether one actually likes animals. Instead, this area of research can reveal, among other things, how institutionalized speciesism enables a wide range of other discriminatory practices and patterns of thought. Actions may speak louder than words, but language – literature – shapes our thoughts and actions. What does it mean to treat humans “like animals” or to declare them to actually be (non-human) animals, rather than people? Such dehumanizing rhetoric and treatment rests above all on an insistence on the human-animal divide; it is racism grown from speciesism. Actions may speak louder than words, but language – literature – shapes our thoughts and actions. Among the many reasons to study animals and literature now is to investigate the development of the notion of the human-animal divide itself and to destabilize it, to understand that animal tropes impact how we value actual animals and humans, and to reconsider the far-reaching consequences of the history of humans’ “thinking with” animals and animal representations – and our simultaneous exploitation and devaluation of both human and non-human beings.